If you’ve been following us for a while, you know that 2018 is our #yearlongparty. The idea was to attend a party of some sort every month which can be anything from a festival to a cultural or sporting event. We’ve already written posts for many of the things we did this year like celebrating NYE in Valparaiso, Carnaval in Brazil, and the World Cup in Russia. While Sasha was gallivanting around Europe on his way to the World Cup, I was chilling out in Puerto Vallarta decompressing from our epic trip to South America (where this year-long party idea was born). My parents came to visit during this time and I finally got to be a tourist and enjoy a Puerto Vallarta vacation. I planned a full week of adventures for us and I have to say I’m pretty proud. It was kinda nerve racking because I wanted to show them why I love it so much. I wanted them to be impressed not just with my planning skills but also with the hospitality the city has to offer. This post is all about how to plan and execute the perfect week-long vacation for any age in Puerto Vallarta. What do you want to do most in Puerto Vallarta? There are so many amazing things to do in Puerto Vallarta. It can be hard to choose the best activities and the best tour operator. I did some research and decided to go with Vallarta Adventures. They had all the tours that I wanted to do. Plus, they had a 3-for-2 tour deal where if you purchased 3 tours, the cheapest one would be comped. I have to say, I’m so happy with my decision to go with Vallarta Adventures. Everything was organized and very professional. *Disclaimer – I DO NOT work for Vallarta Adventures. This is a personal blog and that is my personal recommendation. Of course, there are other tour operators in Puerto Vallarta. Just do your due diligence and do some research before booking tours with them. The tours that I mention in this article can be booked with any tour operator. They are not exclusive to Vallarta Adventures. You know those tour guides that just seem like they’re going through the motions, as though it’s just their daily routine that they do to earn money? The guides that work for Vallarta Adventures are not like that. One of our guides sneaking in a selfie at a tequila tasting! They’re passionate and they love what they do. You can tell by the way they conduct the tours. They’re excited and they want you to be excited too. All the guides were extremely knowledgeable and went out of their way to make sure everyone had a good time. Not only did they know how to inform, but they knew how to entertain. We all felt the tours were worth what we paid for them as we got to see Puerto Vallarta from a different perspective and learn a lot about Mexican history, culture, and food. Viator also has a lot of different tours available in Puerto Vallarta that are worth checking out. Many of their excursions are booked through Vallarta Adventures. We chose to do the Rhythms of the Night cruise and dinner show, a luxury sailing trip around the Bay, and a day tour to San Sebastian del Oeste. *Important to note – If you are going to Puerto Vallarta in high season (November-April) then I highly advise booking your tours in advance as this is the most popular time of year and these tours sell out. If you’re going in the low season (May-October) you can wait until you arrive and book your excursions with an agent. Contact me if you want my guy’s contact info! The Rhythms of the Night cruise and dinner show was by far my favorite tour that we did! I enjoyed it so much that I’m planning to do it again and take Sasha so he can experience it. It’s a full 5-hour excursion with non-stop entertainment. I personally felt like it was worth every penny. There’s a reason why it’s the #1 tour in Puerto Vallarta. This tour does not include hotel pickup, so you’ll have to get yourself to the Maritime Terminal in Puerto Vallarta (unless you are leaving from Nuevo Vallarta, then you go to the Vallarta Center). You will need to pay a fee and put your bag through a scanner to enter! This is separate from the tour as this is also a base for the Mexican Navy. The evening begins on a sunset cruise across the Bay to Las Caletas. They boarded everyone on the boat and immediately started serving up drinks! Oh, I guess I didn’t mention there was an open bar on the boat. That’s right, there were 5 or 6 servers carrying around trays full of beer, margaritas, and rum punch. There was an MC on the mic keeping everyone entertained throughout the ride while we enjoyed the views of the city. About an hour later, we arrived at Las Caletas. It felt like we were arriving on a deserted island full of wild animals and tribal natives. The beach was decorated with tiki torches and candles lighting the path and several performers from Savia were stationed along the path dressed in elaborate animal costumes. It really helped to set the tone. They led everyone around a winding path to the theater, which was surrounded by trees. It really felt like we were in the jungle. The main stage is built to look like an ancient Aztec pyramid and a projector played colorful images on the front of the pyramid while people took their seats. We were waiting with excited anticipation for the show to start. If you’ve ever been to a Cirque du Soleil performance then you can imagine what Savia is like, as it was created by the co-founder of Cirque du Soleil. It’s an incredible display of high-flying acrobatics, dance, fire spinning and more. The show combines all of these to tell the story of Mexico’s history from Aztec times. There were two singers to accompany the performance. We couldn’t understand the words but their voices were beautiful. The show did not disappoint. It was truly incredible! After the show, they led everyone to the many seating areas for the candlelit dinner. I was quite impressed with the food! It’s a buffet dinner and buffets for tours are usually pretty lackluster in my experience. However, this buffet was quite tasty! They had a wide variety of delicious meat and veggies dishes as well as a nice mix of Mexican fare and other dishes. Dinner also had free-flow alcohol with wine and beer. They also had coffee with Kahlua that paired well with the deserts. After dinner, we had about 30-45 minutes to wander around and lounge in one of the many hammocks on the beach. Then it was back on the boat. The boat ride back was just as entertaining as the Savia performance. All the guys who had been serving drinks along with the MC dazzled the crowd with a rousing show of classic rock tunes. Complete with costumes, wigs, and instruments, they danced a choreographed routine while lip syncing and solo air guitaring. This is what I mean when I say Vallarta Adventures tour guides know how to entertain! The hour-long ride seemed like it only took 10 minutes because everyone was having so much fun. It was pure, non-stop entertainment the whole evening. You should be aware that there are two shows per night in the high season. There is an earlier and later starting time. One group sees the show first and then has dinner while the other has dinner first and then enjoys the show. For the boat ride back, I would recommend bringing a jacket if you’re there from December to February as it returns after dark. All in all a really fun evening! This is an awesome tour if you’ve never been sailing before. The guides will show you how to sail and let you try it out for yourself. The tour starts in the late morning at 9:45 so it’s good for non-morning people or those of us who teach English online in the mornings (aka me). After a brief safety and boat orientation, we set out into the Bay. They immediately got to work serving up drinks as this tour also has an open bar. It was the first time I had ever seen the city from the water and it was really cool to enjoy the beautiful scenery while sipping on a michelada. All the guides were super friendly and went out of their way to make conversation and loosen people up. The World Cup was going on at the time and they were so excited to hear that Sasha was there and that he had attended the Mexico vs. Germany match. One guy was so impressed, he was translating everything to the girl bartending below the deck. My mom and I giggled over how stoked he was about it. He definitely earned his propina (tip)! They took us across the Bay to a small, secluded beach where we got to jump off the boat to swim and chill on the beach. For those who need something to do, they also bring along a SUP (Stand Up Paddleboard) and snorkeling gear. Next, they brought us back on the boat for lunch. Everyone got their own bento box with fruit, meat & cheese, pasta salad, and a few other snacks. They kept the drinks flowing and put up the sail. Once they turned off the motor and turned on some tunes, we were literally smooth sailing. After we all had enough time to get a true feel of sailing, we headed back to the Marina. If I were to do it over again, I would choose a sunset cruise. Originally, I wanted to do the sailboat cruise to Los Arcos but the time conflicted with my online teaching schedule. I was disappointed at first but in the end, I’m glad that tour didn’t work out because we were able to do a much better tour to Los Arcos a few months later with our friend Felix. It’s a SUP tour where you paddle yourself out to the granite cliffs from Mismaloya beach. We were able to take our time to snorkel and paddle through the tunnels at our own pace. If you like paddleboarding or have been dying to try it, check out Felix’s SUP to Los Arcos Airbnb experience. This day trip is the perfect way to escape the heat of Puerto Vallarta and learn an important part of Mexico’s history. San Sebastian del Oeste is a Pueblos Mágicos (Magical Towns or Magical Villages). These are a selection of Mexican villages whose cultural, historical, gastronomical, or natural treasures have been deemed exceptionally special and meaningful to Mexico’s heritage. While each town stands outs for their unique characteristics, travelers will find themselves transported to an earlier time away from the hustle and bustle of the city. There are 111 total Pueblos Mágicos Mexico. Located at the foot of the Sierra Madre mountains, San Sebastian del Oeste is higher in elevation than Puerto Vallarta and therefore much cooler. It takes about an hour and a half to get there. On the way, we stopped at a small restaurant and bakery to enjoy some delicious pastries and coffee. Then we stopped at a tequila distillery where we learned the process for making tequila and tried several different flavors including coffee and honey almond. All the while in the car, our guide Ruby told us the history of the town and how it rose to prominence when Spanish settlers moved from Spain in the 1600s. San Sebastian was established as a wealthy mining town that produced silver, gold, and other metals. By 1812, it was one of the wealthiest cities in New Spain. The last mine was abandoned in 1921 and what was once a city of 20,000 people became a ghost town and fell into oblivion. Today 600 families live in the town which looks the same way it did in it’s heyday full of public squares, the old prison, adobe homes, and silver shops. You’ll have to join the tour to get the full story of this once prominent city. Puerto Vallarta vacation would be complete without a tour of the city itself! For this, we chose to go with Gray Line and I’m so happy we did. We decided to go kind of last minute, as in, we booked it the day before! They were incredibly accommodating and helped us figure out the best hotel for the pickup as we were staying in an Airbnb. When the van and the guide showed up, they informed us that the other van was full so they pulled out an extra one just for us and gave us a private tour! Talk about service! Our tour guide was a PV native named David. We enjoyed his dry sense of humor that he mixed in with information about the city, both good and bad. He explained the effect tourism has had on local residents and the real estate market. I think it’s something that all travelers need to be aware of and it was very interesting to hear from a local. The tour is very aptly named as we saw every corner of the city. It started off in Pitillal, the oldest neighborhood in Puerto Vallarta. We got to try some fresh, locally grown pineapple and a traditional Mexican ice pop. We also toured the church beside the central square. From there we went to the mangroves and learned about the effort to protect the crocodiles. They are being forced out of their natural habitats because of development. After that, we headed south to the Malecon and learned about the sculptures, tried a Tuba drink from the Tuba man, toured the Virgin of Guadalupe Church, and stared in awe of the scenery from the Los Nogalitos and Mismaloya viewpoints. The tour finished with a traditional Mexican lunch a tequila tasting. There are lots of other things to do in Puerto Vallarta besides big tours. One of my favorite things to do is spend an afternoon at the Vallarta Botanical Garden. It’s located in the mountains about a 40-minute drive south of the city proper. We took an Uber there for about $12 and returned by local bus. The park is full of both native and exotic plants from around the world. There are also several hiking trails. The longest trail takes about 30 minutes to hike, depending on your physical fitness level. It’s a fantastic place to have lunch as their restaurant is pretty well-known around town. We went and spent the afternoon hiking around. We also did some shopping for gifts in the souvenir shop. Another great activity is sitting on the beach! Even if you’re not really a beach person, you should set aside at least one day of your Puerto Vallarta vacation for a beach hang. If you prefer to stay in town, there are excellent bars and restaurants along Los Muertos beach in the Romantic Zone. We went to my favorite beach bar/restaurant called Fidencio’s and spent the afternoon there. It’s beside Las Carretas and their prices are much cheaper than the other bars around it. If you prefer a quiet beach with no bars/restaurants, then head to one of the many beaches in the South Zone. Playa Las Gemalas is a favorite among locals. You could also hike from Boca de Tomatlan to Playa Las Animas and spend the afternoon there. You can find more details about the hike in our post about all the things to do in Puerto Vallarta. Puerto Vallarta has an abundance of amazing spas where you can spend the day pampering yourself. We indulged in Swedish massages at the Southside Spa. It’s one of the best massages I’ve ever had! You’ll also find plenty of places to get a manicure and pedicure. You could easily spend an entire day indulging. La Traviata – located on the top floor of the Hotel Paloma del Mar, they have a beautiful ocean view and delicious Italian fare including pizza and vegetarian dishes at a very reasonable price; much less than the US. Ah! Caramba – This is the place for the best sunset dinner. They’re located high up in the hills with an even better ocean view. Serving Mexican fare and seafood dishes, they also have an extensive cocktail list at a slightly higher price point. El Barracuda – This is my favorite place to eat on the beach! Dine with your toes in the sand. Their seafood and taco selection are both excellent. Good for both lunch and dinner. La Tia Mariscos – Small Mexican restaurant serving the best marlin tacos in town! Marlin: the bacon of the sea 🙂 Located on the corner of Calle Honduras and Calle Peru. Barcelona Tapas – Spanish style restaurant serving tapas, paella, and other traditional Spanish dishes. With an extensive wine list, they also have incredible ocean views. Try to be there around 9:30 pm to watch the nightly fireworks display from the Pirate Ship. True to Spanish culture, they stay open quite late. La Palapa – Enjoy fine dining right on the beach! This is one of the first fine dining establishments in Puerto Vallarta. I took my parents here for their last breakfast and it was incredible! Mango’s Beach Club – This is a great place to have breakfast. They have a breakfast buffet on Sundays. We ate here before heading to the Botanical Garden. I always prefer to stay in an Airbnb. I love being able to cook for myself if I don’t feel like going out. It’s much easier to whip up a quick breakfast before heading out on a tour in your own kitchen than being waited on in a restaurant. I reserved this place for my parents’ stay. It’s the perfect place to chill out after a long day. The roof has a plunge and a BBQ. We use Airbnb so much that our affiliate link will get you $40 off your first stay! Even if you already have an Airbnb account, you can create a new one with a different email address and take advantage of the discount. I’m working a post that’s all about awesome Airbnbs in Puerto Vallarta so stay tuned! If you’d rather stay in a hotel, then I always recommend using Booking.com. Almost all hotels, including the all-inclusive resorts, are on Booking. Plus, they always have some great deals. The best part is that they have free cancellation up to a certain date if your plans change! Find an awesome deal in Puerto Vallarta! Puerto Vallarta is a fantastic vacation destination even if you don’t consider yourself a beach person. The city is beautiful and there are more than enough things to do for a week long vacation. There were several other things I wanted to do with my parents like the hike to Playa Las Animas or walk up to the cross looking over the city to enjoy the views. Puerto Vallarta has something for everyone of any age and on any budget. 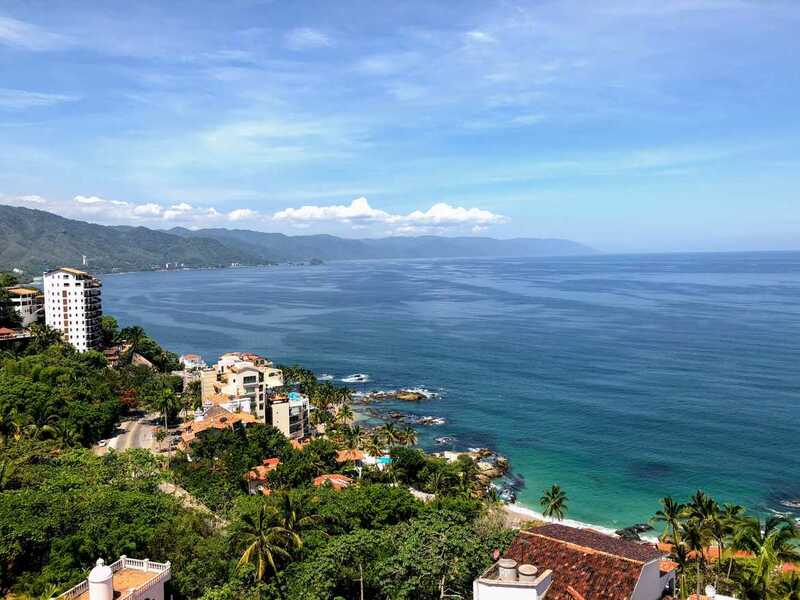 I hope this has given you a few ideas for how to plan a Puerto Vallarta vacation! Feel free to leave a comment or contact us directly if you have any questions! Join our mailing list so you never miss a post like this! Yay for transparency! This post may contain affiliate links. If you make a purchase through these links, we will earn a commission at no extra cost to you! We use the funds to keep this site running. We’re so grateful for your support!